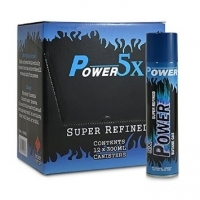 We offer the Power 5x Case at the best deal to everyone. This case is filled with 12 cans with 300ml of butane each. Pros: Great price and shipping was much faster than my last order. Shipped out the next day and I had it in a week. Not bad considering I ordered it the week before Christmas.